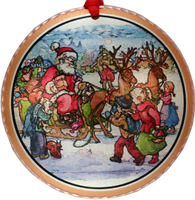 We just finished our new designs for Christmas tree ornaments. This time we tried something that we never did before, by creating colorful holiday ornaments from copper in colorful designs such as Santa Claus, Nativity Scenes, Christmas trees and angels. Also nostalgic themes like old fashioned town square, skating and country churches. 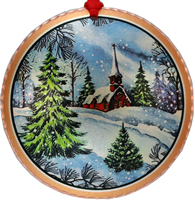 Our designs varied and sure to please everyone on your Christmas list. Making the Christmas ornaments, with these new technique that we came up with, takes about to complete each piece. Each piece is diamond cut by hand individually to bring out the luster in copper and make the ornaments sparkle. We have to use three layers of acrylic finish. So these handmade copper ornament would not require any maintenance. The colors printed on silver plated copper surfaces so the colors look translucent which makes them more unique. will add a crafty elegant and original look. They are not heavy they can be hang any branch of the tree. Please visit the official website of Copper Reflections HERE.